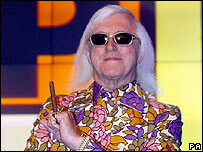 Sir Jimmy Savile will co-host the final edition of Top Of The Pops on 30 July. The veteran DJ, 79, said he immediately agreed to take part in the show, telling producers: "I did the first one, and I'll do the last." According to Broadcast magazine, Sir Jimmy will be joined by other former Top Of The Pops presenters such as Pat Sharp, Tony Blackburn and Mike Read. The BBC announced last month it was cancelling the long-running music show because of falling audiences. In its 1970s heyday Top Of The Pops was regularly seen by 15 million viewers, but recent programmes on BBC Two have struggled to find an audience of more than one million. Sir Jimmy presented the first ever edition of the show from a converted church in Manchester on New Year's Day 1964. The programme included music from The Rolling Stones, The Beatles and Dusty Springfield. The former Radio 1 DJ says the BBC phoned him last week and asked him to take part in the final edition of the programme. "They're not even entirely sure what the format will be yet," he told the BBC News website. "It's all up in the air." A spokesperson for Top of the Pops confirmed Sir Jimmy's involvement in the last show but said full details of the format and line-up were still being finalised.